I have the classic problems related to a failing MAF (99' 2.5L Boxster - MAF Part # 996 606 123 00). I want to replace the unit myself, but is it neccessary to recalibrate the MAF and ECU after a new one is installed? (My dealer wants $375 for the unit and 1.5 hours labor, when I can buy it for $235 and install it myself in about 15 mins.) :soapbox: I cleaned it today and will see if this helps, but I'm pretty sure it needs to be replaced. Only issue I have is whether I need to have the ECU recalibrated.......and if so, how much should I expect to pay the dealer for this? Good for you. You will be fine with your 2.5 if cleaning it does any good. Sometimes they get physically damaged from flying junk - look at the thing that looks like a mirror and see if there are any flaws. 2 Porsche factory trained mechanic friends said it cannot be cleaned as the parameters will be changed. The 3rd had not tried but thought it was worth a try. Nothing needs to be recalibrated if it is replaced on a 2.5 as there is only one version. For the 2.7 and 3.2 a more contamination resistent sensor came out in 2000. If this revised sensor is put in a 2.7 or 3.2 programmed for the original style sensor, then the DME/ECU has to be reprogramed for the new style sensor. Wow....thanks for the great reply! Mine looked identical to the pictures....even with the dust! So far so good as the Check engine light has not come on again (been about 40 miles so far). I still feel some hesitation at times...so I'm not real optimistic....but ya never know till ya try! I'm temped to buy a new one and just swap it out to see if there is it solves some of this issue. I should add, it's for a 2.5. I did not write down the Bosch part number, but here is one I saw on ebay. You might be able to make out the Bosch part number. Ooops - this is not a picture of a 2.5 sensor. Thanks, Toolpants. By the way, I still have the same AOL address. I just use the hotmail account to sign up for websites. I found this place online that's selling a new MAF for $170, a lot less than sunset or suncoast. I've used them before to buy O2sensors. The sensors were less than 100 each. I'm going to give them a call to confirm they have the correct part. By the way, they list the 2.7L MAF for $370! That must have been some update. Let us know if you find an aftermarket source for air flow sensors and the part numbers. They are way over priced at the dealer. There are 2 different MAF's (Mass Air Flow Sensor's) for 2.5L engines. "996 606 123 00" - Standard MAF - Roughly $375 at most dealers! "986 606 125 01" - Some engines had a tech bulletin, that required this MAF - $495 at most dealers!!! The part number on the above picture I assume is for a 2.7L engine. 700 miles so far and NO Check Engine Light thus far! Cleaning the MAF has solved the CE light so far. However, the engine is still experiancing hesitation at various times under hard acceleration. I will be swapping out the MAF to a new one and will see if this corrects the hesatation. Good eyes Dave. I should not have posted the third picture as it is a new style 2.7/3.2 sensor and the part number has changed in any event. The new style has a curve at the bottom of the sensor which you can see in the third picture. Dave, please post the Bosch part number for your 2.5 sensor for Mark when you take it out. I just checked with parts and these are the current part numbers and full list prices. My dealer does not charge me full list. We might have a winner!!! I just called up the place and I've asked them to read the Porsche number on their MAF. They gave me 996.606.12300. They call it an Air Mass Meter, PN B3130-70627. It's in stock. They confirmed it's a Bosch part. The list price is $327.69 and their price is $166.26. Shipping is free for anything over $50. I contacted both Sunset and suncoast, their price was $245 and $275 respectively. I guess I'll be the guinea pig and try to order this MAF online. They also have the new style MAF, but that's around $400. I have a pesky CE light that's been bugging me. It started after I added a K&N (a month after I bought the car). It keeps throwing O2 sensor codes at me. P1102, P1107, P0140 and P1117. All 4 points to the heating element. I've tried swapping out relays and checking the voltages and checking for shorts, no luck. I've swapped out the O2 sensors. Still no luck. I've tried cleaning it with contact cleaner, no luck! Now, I'm going to try swapping the MAF. I've taken it to the delaer, and the work order said it had a vacuum leak. They cleared the code and the CE light came back on after 1 month. I'll update you folks if this website is any good. Sure sound like the correct sensor at a more reasonable price. Us 2.5 owners are lucky, I guess, as there is only one sensor. 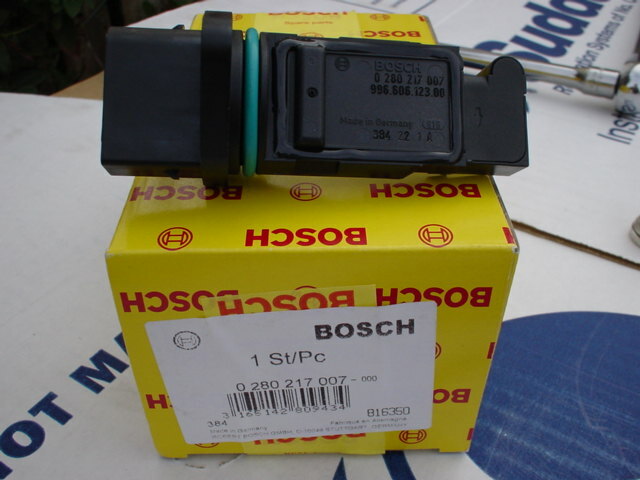 I once asked the guys at AB why Porsche did not improve the design of the 2.5 sensor like Porsche did for the 2.7/3.2. We have old cars is what I was told. Get rid of that K&N if you have done so already and put the paper filter back in or you might contaminate the new sensor. Air Filters by the way are $23.56 (my dealer $39.32!) Pollen Filters $36.84 vs. $59.09. Price's look very good ! Keeping my fingers crossed, too. I think the parts bin has multiple websites, not just two. I've ordered from one of their websites before. All of the websites have the same interface and points to the same SSL site. By the way, the airfilters and Pollen filter are branded Mahle. It doesn't have the magical Porsche brand (in gold leaf) ;) thus the lower price. It looks the same stuff to me. Good luck guys and give us a report when you get the sensor. Mahle and Mann make the filters for Porsche. Next time you buy a filter from Porsche in the gray box look at the part numbers and they have the same Mann or Mahle part numbers - but without the price. I have also see the local dealer using filters that did not come in the Porsche box. Thought I would add this pic since it is helpfull regarding this topic that was posted on TOB. You just incriminated yourself with that picture if it is your car. I see a K&N sticker on the air box. Suggest you go back to the oem paper filter if you have not already done so before you put in a new sensor. Parts are IDENTICAL! :clapping: Very happy! Good detective work. Same part at about half the price. I have looked at many electrical connectors. Have yet to see one with a Porsche logo. Instead, BMW, VW, Audi, and Mercedes with their part numbers plus sometimes an AMP part number. Done many trip computer retrofits over the years and we buy from Porsche a connector and a cover for the connector to plug into the trip computer stalk. Years ago it was $1.50 from the Porsche dealer. Then everyone started doing the trip computer retrofit. Porsche then jacked up the price to almost $10 for two little pieces of plastic. It has a BMW and AMP part number on it. Down the street from my local Porsche dealer is a BMW dealer. I showed their parts department the connector and cover with the BMW part numbers on it. $1.50. It is used for their alarm system. Porsche makes nothing. We need to out smart them. Almost $400 for that sensor is crazy. $10 of plastic in the pic. That's great news, Dave! I'm off to Vegas for thanksgiving so I opted for regular ground shipping. I'll get mine Dec. 1st. glad to know I won't be expecting any surprises. I've learned to shop around after being charged $25 for my first oil filter from the dealer. Here is Mark's sensor that he put in today. Exact same sensor sold by Por$che.